Written by Myles on Friday, June 25, 2010. We rarely know the history of toys we own. 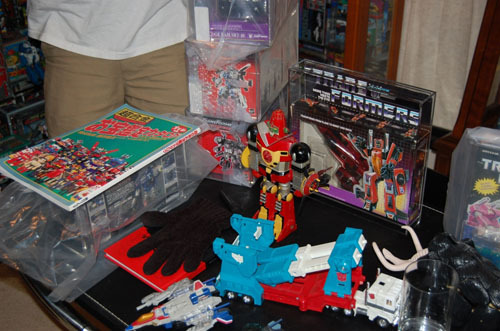 When we purchase a vintage toy through ebay or Yahoo Japan, its typical a cold transaction. We send the money, and the toy arrives in the mail without much communication or hooplah. We rip open the packaging, and throw the toy up on our shelves after a little fiddling. We appreciate the toy for its current state and what it represented when it was made, but we rarely know the history of a toy - where it was purchased, when it was bought, or who owned it previously. Sometimes knowing this can make a collectible all the more special. on Saturday, May 22, 2010. Written by Myles on Friday, August 14, 2009. July 2009. Times are tough. Real tough. This economy is making secure folks not so secure. I have a great job that seems to be very reliable, even in times like these. However, my wife's job is another matter. She was a new teacher this past year, and the County decided to make massive cuts in teaching, and basically all new teachers were layed off. Covering bills has become difficult, and I had to make a statement that I would stop buying robots. Although it was a tough statement to make, I said it. And I meant it. Written by Myles on Thursday, February 26, 2009. Hello. My name is Myles and I am a collectorholic. I have a constant burning desire to purchase Japanese robots. I spend endless hours perusing the online photographs of other people’s expansive and colorful collections with envy. Damn you all! However, as with many collectors, I also have a wife who not only acts as a roadblock to my carefree purchasing, but also deflates my tires and hides the keys. And I have a three year old son who likes to “just look” at my collection with his hands. on Tuesday, January 13, 2009. The square white-washed and worn sandwich sign with primitive KMH print was still propped up as it did for years. The square mundane door with steel reinforced window mesh was still on guard. Foot-worn coves in the squared off M.C. Escher-esqued stairs led up, as before; and the square roof still stood high in the sea of man’s concrete happy village of generic tope masses. 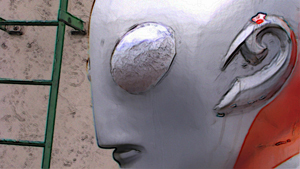 However Ultraman, as always, was there to greet us and rekindle the soon-to-be former funk palace of Kimono my House. Written by Ed on Tuesday, September 02, 2008. The summit was truly a blast. 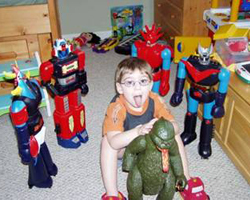 Ed and family opened up their home for an eclectic group of collectors (from Lucky Draw to Jumbo Machinder to Transformers to diecast collectors) who all meshed perfectly! Rather than rambling on, we'll let the pictures do the talking. on Saturday, April 26, 2008. The one of a kind 80's replica was made by John Rigg-- 7-ft.-tall talking Robby the Robot from the film Forbidden Planet to be auctioned WESTHAMPTON BEACH, N.Y. In an Internet auction closing May 14, Grey Flannel Auctions will offer a collection of coin-operated arcade machines and oversize figures that greeted visitors to the futuristic 1962 Seattle World's Fair. on Saturday, May 05, 2007.
on Wednesday, May 17, 2006. Omega Supreme bounced into my radar screen in about the Winter of 2004 by accident. 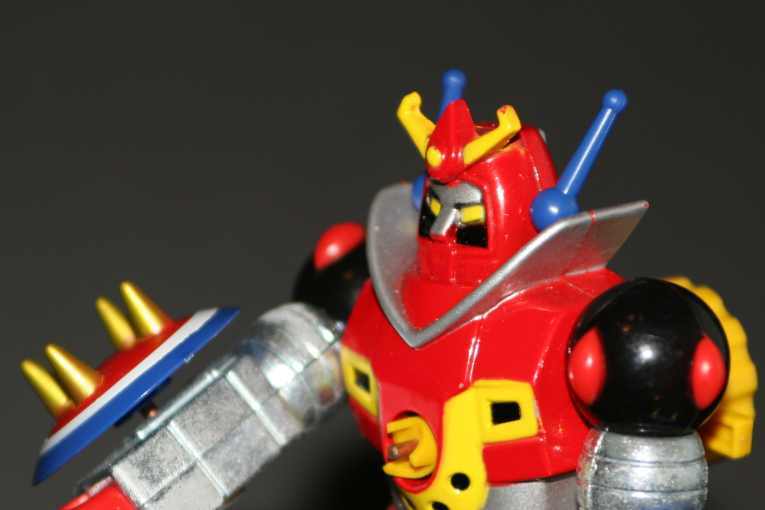 This crazy-huge robot toy was featured on an ebay auction in the murky depths of prototype listings. At the time I didn't know what to think. on Thursday, May 11, 2006. 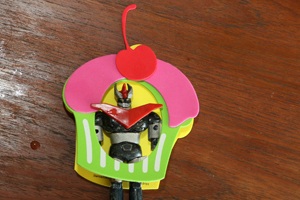 Every now and then a robot toy comes and goes without even hitting my radar. In times past I almost missed out on the Iron Giant and just last year I failed to notice the new Robots toy Rodney Copperbottom.